The Taxation and Investment Regime for Pradhan Mantri Garib Kalyan Yojana, 2016 (hereinafter ‘the Scheme’) provides an opportunity to persons having undisclosed income in the form of cash or deposit in an account maintained with a specified entity to declare such income and pay tax, surcharge and penalty totaling in all to 49.9 per cent. of such declared income and make a mandatory deposit of not less than 25% of such income in the Pradhan Mantri Garib Kalyan Deposit Scheme, 2016.The Scheme has commenced on 17.12.2016 and shall remain open for declarations/deposit upto 31.03.2017. Question No.1: Whether the amounts deposited in an account maintained with a bank or post office like Saving account, Current Account, Recurring Deposit Account, Fixed Deposit Account, PPF Account, Senior Citizen Saving Scheme Account, Monthly Income Scheme Account, Jan Dhan Yojana Account are eligible for being declared in the Scheme? Answer: As per section 199C(1) of the Scheme, a person can make declaration in respect of any income in the form of deposit in an account maintained by the person with a specified entity and as per Explanation to section 199C(2) the banks and post offices come under the definition of specified entity. Hence, the undisclosed income deposited in the accounts specified above can be declared under the Scheme. Question No.2: Whether declaration under the Scheme can be made in respect of income which is represented in the form of investment in any asset like jewellery, stock or immovable property? Answer: No. Under the Scheme, only income represented in the form of cash or deposit in an account maintained with specified entity can be declared. The Scheme is hence not available for declaration of an income which is represented in the form of assets like jewellery, stock or immovable property. Question No.3: In case a deposit is made by interbank transfer i.e. transfers from one account to another account, whether such deposit can be declared under the Scheme? Answer: Yes, a declaration under the Scheme can be filed in respect of deposits made in an account maintained with a specified entity by any mode such as cash, cheque, RTGS, NEFT, or any electronic transfer system. Question No.4: Where a notice under section 142(1)/ 143(2)/ 148/ 153A/ 153C of the Income-tax Act has been issued to a person for an assessment year, will such person be eligible for making a declaration under the Scheme? Answer: Yes, such person is eligible to avail the Scheme subject to fulfilment of conditions specified in the Scheme. Question No.5: Can a person against whom a search/ survey operation has been initiated, file declaration under the Scheme and whether the cash seized during search operation can be declared under the Scheme? Answer: Yes, a person against whom a search/survey operation has been initiated is eligible to file declaration under the Scheme in respect of undisclosed income represented in the form of cash or deposit in an account maintained with specified entity. Question No.6: Whether credit of advance tax paid, tax deducted at source (TDS), tax collected at source (TCS), in respect of an income declared under the Scheme would be available? Answer: No credit for advance tax paid, TDS or TCS shall be allowed under the Scheme. Question No.7: Whether undisclosed income represented in the form of deposits in foreign bank account is eligible for the Scheme? Answer: Clause (d) of section 199-O of the Scheme provides that the Scheme shall not apply in relation to any undisclosed foreign income and asset which is chargeable to tax under the Black Money (Undisclosed Foreign Income and Assets) and Imposition of Tax Act, 2015. Hence, undisclosed income represented in the form of deposits in foreign bank account is not eligible for the Scheme. Question No.8: Can a person come under the Scheme with respect to deposit made in a bank account prior to the Financial Year 2016-17? Answer: A person can avail the Scheme for any assessment year commencing on or before the 1st day of April, 2017. Hence, deposits made in bank account prior to financial year 2016-17 can also be declared under the Scheme. Question No.9: If a person does not declare undisclosed cash deposited in an account between 01.04.2016 to 15.12.2016 under the Scheme, then whether such undisclosed deposit shall attract tax at the rate provided in the Taxation Laws (Second Amendment) Act, 2016? 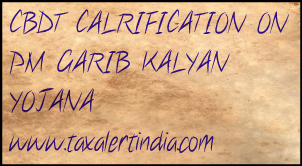 Answer: The amended provisions of section 115BBE of the Income-tax Act, 1961 shall apply to A.Y.2017-18, relating to F.Y. 2016-17. Hence, undisclosed deposits between 01.04.2016 to 15.12.2016 shall also attract tax at the rate provided in the Taxation Laws (Second Amendment) Act, 2016. Question No.10: Whether undisclosed income deposited/repaid in an Overdraft Account or Cash Credit Account or any loan account maintained with a bank is eligible for being declared under the Scheme? Answer: Yes, the amount deposited or repaid against an overdraft account/cash credit account/any loan account maintained with a bank or any specified entity is eligible for being declared under the Scheme. Question No.11: Whether the cash seized during a search and seizure action of the Department and deposited in Public Deposit Account is allowed to be adjusted against the payments required to be made under the Scheme? Answer: The adjustment of cash seized by the Department and deposited in the Public Deposit Account may be allowed to be adjusted for making payment of tax, surcharge and penalty under the Scheme on the request of the person from whom the cash is seized. However, the said amount shall not be allowed to be adjusted for making deposits under the Pradhan Mantri Garib Kalyan Deposit Scheme. Question No.12: Person ‘A’ made an advance in cash for procurement of goods (other than immovable property) or services to person ‘B'.Person ‘B’ deposits this amount in his bank account. Person ‘B’ subsequently returns this amount to person ‘A’ in cash or through digital means as the purpose for which advance was made did not materialise. Can person ‘A’ declare this amount under the Scheme? Whether penalty under section 271D or 271E shall be attracted in the case of person ‘B’? Answer: Yes, person ‘A’ is eligible to declare the said amount under the Scheme. Since the advance was made for procurement of goods (other than immovable property) or services, no penalty under section 271D or 271E of the Act shall be attracted in respect of the said transactions.